Mini Cowboy Kit.Includes: Mini cowboy hat, badge, bandana and felt moustache.Size: Adults and kids ages 14 and up. *Costume and Gun Not Included.Wee dawgy and ride 'em cowboy! This hilarious mini cowboy kit comes complete with miniature sized hat, bandana and felt mustache. When caught in the crossfire at the OK Corral, you'll knock 'em dead with laughter! Cowboy Western String Tie.Age Category - Adults.Includes: One Cowboy Western String Tie with Horse.Cowboy Western String Tie This is great look for any Western or cowboy costume! 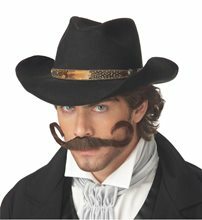 Gunslinger Moustache Brown Includes: A synthetic Dark Brown Moustache with adhesive on the back. Great for Villain Characters and Western Costumes. Cowgirl Pink Sheriff Badge;Ladies, it is time to bring law and order to this unruly Wild West era. 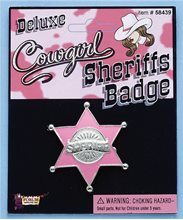 Our Deluxe Cowgirl Pink Sheriffs Badge will give you the power and authority to run the costume party your way! Our Cowgirl Sheriff Badge features a silver trimmed pink star with sparkles and a center "Sheriff" print emblem. Pin it on your cowgirl Halloween costume for a detailed finishing touch. Cowboy Spurs.Includes: One Pair of Cowboy Spurs. Available Size: One Size Fits Most Adults and Teens. *Costume Not Included. Accessories Sold Separately. WARNING!! : CHOKING HAZZARD - Small parts. Not for children under 3 years. 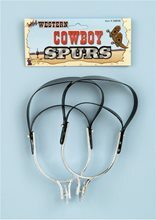 Recommended for ages 14 years and up.Complete your cowboy costume with these Cowboy Spurs! 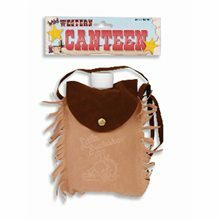 Western Canteen,Cowboy Costume Accessory ,comes with canteen Western Canteen in a faux suede pouch. Plastic, usable bottle. 6"x 4". 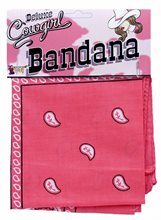 Pink Cowgirl Bandana.Includes: One Pink Cowgirl Bandana. Available Size: One Size Fits Most Adults and Teens. *Costume Not Included. Western Gun Set with Mask.Includes: One Western Gun Set with Mask. *Costume and Accessories Not Included. Sold Separately. 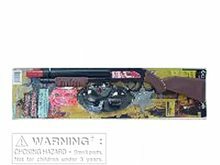 This Western Gun Set And Mask is you lock like a police man. Kids will love the fun, and you'll love its low wholesale price.